Pittsboro, NC – People love their pets. I love my dog Princess. Yep, that’s her name. Don’t mock, don’t judge. 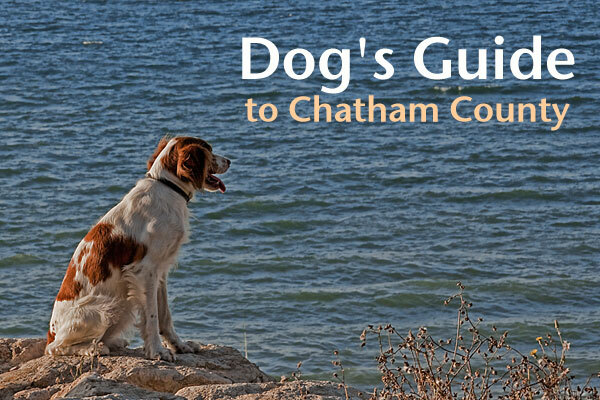 For all you pet-lovers in the area, here’s my Dog’s Guide to Chatham County. First of all, let me specify Eastern Chatham County – Pittsboro and environs to be exact. I just love curling up with Princess on a cool autumn night. But sometimes you just want to get out of the house, get some fresh air, see the birds and the progression of the seasons in our beautiful corner of the North Carolina Piedmont. So here is my Dog’s Guide to Chatham County. From Pittsboro on 15-501, park is just before Southern Village. Nice dog park and disk golf too! Jordan Lake State park allows dogs but must be on leash, I like to take my dog kayaking with me, she looks so cute in her life vest. Briar Chapel has a Dog Park, but it is not open to the public. However, their extensive trail network is, and their mountain bike trails attract visitors from throughout the region. Additionally, a 66 acre County park is being developed on Andrew’s Store Road, with football, soccer and baseball fields available for public use. Click on Amenities, then Trail System. I also love to take Princess to Raven Rock State Park to do some hiking and beautiful sight seeing over the Cape Fear River. I take my dog to Pettsboro Groom & Room when I’m out of town. Toni just loves the dogs. What’s Your Favorite Doggie Spot? Do you have a favorite spot to take your dog in the area? Leave a note in the comments to the story or send me an email. I wish to highly recommend my vet – Vet Hope Crossing. administering the last medications. Their prices are fair and their team is reliable. They are located on Hope Crossing South of Harris Teeter on the left.